Trace Adkins has been around for a long time, perhaps even been counted out once or twice along the way. He’s had a handful of big singles that have brought back some forward momentum when his career has started to lull. But even when he has faltered, it usually hasn’t been because of a lack of good material or good vocal performances. But therein lies the rub: his material and vocal performances are usually good, not great. “This Ain’t No Love Song” continues that pattern. This is a good song, and he sings it well. But it’s not a great song, and he doesn’t sing it well enough to elevate it beyond what it already is. 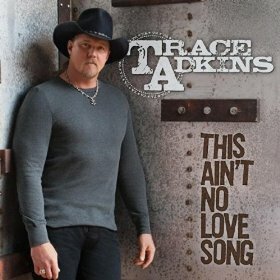 …if chesney is the dark night of the “average empire”, trace adkins is the white one. rock solid song – like the man himself. is excellent average actually more like excellent or average? I do think Trace has an incredible voice, but this song makes it sound like he is running out of ideas. I gave it a mostly positive review, but I did note a few weaknesses. But even when he has faltered, it usually hasn’t been because of a lack of good material or good vocal performances. I’d say that when he has faltered, it HAS been because of a lack of good material: i.e., “Chrome”, “Swing” and “Honkytonk Badonkadonk” among others. Trace is a great singer with a spotty record when it comes to picking great songs. If I remember correctly, Kevin actually liked “Honkytonk Badonkadonk,” at least more than others did. I loved “Honky Tonk Badonkadonk”, and it would be ridiculous to say that it made his career falter, given that it powered the Songs About Me set to double platinum. But he’s stayed in the game longer than most artists who don’t consistently top the charts. Of his 28 official singles, 26 of them have gone top thirty, 22 have gone top twenty, and 14 have gone top ten. Not a bad run, but that so many of them stop before the top ten shows that he’s never quite made it to the A-list. You’ve been giving a lot of good reviews lately. Im gonna keep a running tally. Its not that I disagree with your good reviews. people need to know your reviews are good. And yeah critics just criticize but I’m WAYNOE. I make a lot of money and I even have an education. More than you I bet. Yeah.